The Consumer Information Indicator (CII) contains a value that indicates a special condition that applies to the specific consumer. This special condition may be that a bankruptcy was filed, discharged, dismissed or withdrawn; a debt was reaffirmed; or the consumer cannot be located or is not located. The indicator should be reported one time and will be deleted only when the appropriate removal code (Q, S, U) is reported. The Consumer Information Indicator must be reported only on the consumer to whom the information applies. 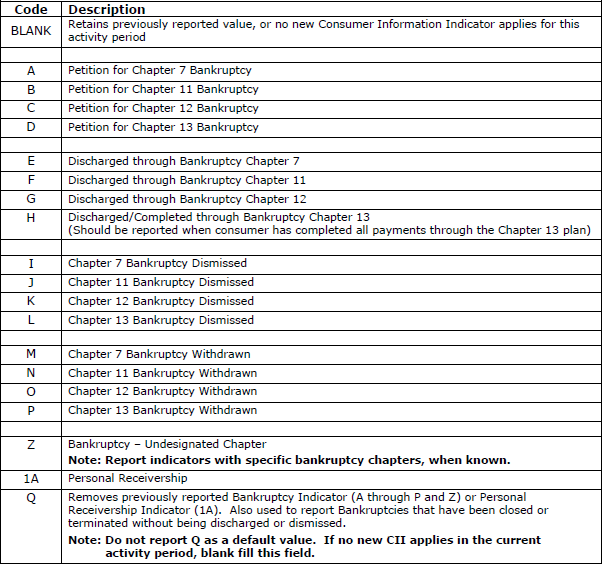 Note: Do not report a bankruptcy indicator if your account is not included in the bankruptcy. Codes W (Chapter 11 Reaffirmation of Debt Rescinded), X (Chapter 12 Reaffirmation of Debt Rescinded) and Y (Chapter 13 Reaffirmation of Debt Rescinded) are obsolete as of September 2010 and may no longer be reported. The Consumer Information Indicator should be reported one time and will be deleted only when another Consumer Information Indicator or a Removal value is reported. As an option, the code may be reported each month as long as the condition applies. Regardless of the method of reporting (one time or each month), the Consumer Information Indicator will be deleted only when another Consumer Information Indicator or a Removal value is reported.